Remove your rings from the solution and brush the top, bottom and sides of the diamond with an old toothbrush dipped in the cleaning solution, to loosen and remove dirt, soap, and lotion residue. Be sure to brush the remainder of the setting, especially if there are smaller diamonds as part of the design. If you have an ultrasonic toothbrush, the next time you replace the brush head, save the old one and use it just for cleaning your jewelry. The sonic action will help get your diamonds sparkling! Rinse your rings under running water (but close the drain to be sure you don’t drop them into the sink drain! ), brushing again with clean water to remove all the cleaning solution. Shake to remove any remaining water droplets, and pat dry with a lint-free cloth or paper towel. If you let the diamond air dry, it will have water spots on it just like a glass that air dries. Your ring should now sparkle like new. Wear it and enjoy it, and clean it regularly to keep it sparkling. If you’re wondering how to clean diamonds when you’re traveling, there are also cleaners that travel well, including an atomizer, a gel cleaner, a cleaning “stick” with its own built-in brush, and cleaning wipes. The cleaning wipes are great for wiping tarnish off your gold and silver jewelry (yes gold will tarnish), but we prefer the liquid or gel cleaner for diamonds because the wipes can’t clean underneath the stones where the dirt builds up, causing your diamond to look dull. You just never know when you might get invited to a special event and want to look your best, right down to your clean, sparkly diamond! Are you looking to have the windows replaced in your home? If you are, don’t do what we did – make sure you do your research! There are a lot of companies out there and a ton of different options. Make sure you know what’s best before you buy. Buying engagement rings is one of the most thrilling moments of your life, but also one of the most terrifying. If you are doing it the traditional way, the man is out on his own trying to determine what type of engagement ring his future wife is going to want to wear for the rest of her life. By studying your girlfriend’s style and asking pertinent questions, you can ensure the success of your engagement ring shopping. While it might seem silly, most women have an idea in their head when it comes to what style of engagement ring they want. Some women care about size while others care about the type of diamond cut. Women who like Marquis cut diamonds might be disappointed if you show up with cushion cut engagement rings. A preliminary trip around a jewelry store can be used to judge her interest in different cuts. Even if you are not looking at engagement rings, pay attention to what types of stones she gravitates towards. Shopping early on for earrings with precious stones or other types of rings might give you a clue as to her chosen shape. Pull in the best friend. She is your best resource if you don’t want to ask your future wife yourself. The friends have usually discussed intimate details about potential wedding plans, engagement rings, and ideas for the future. If you take the friend to the jewelry store she might point you in the right direction of style and cut. She can also ask questions of your girlfriend without raising too much suspicion. Seek out the counsel of a professional so you can verse yourself on the cost of a diamond as well as clarity and color rating. While you can buy a large diamond for a lesser price, how much it sparkles is often more desirable. A noticeable engagement ring that throws perfect rainbows on the wall is often more appealing than a giant stone. Jewelry goes through phases. Silver, white gold or platinum might be all the rage now, but a throwback to traditional yellow gold is beginning to creep back in. You should take a look at your soon to be fiancée’s other jewelry to get a sense of what type of metal she prefers. If she has mostly gold, you should look for engagement rings with a gold setting. If she has mostly white gold or silver, then error on that side. Now, if she has a lot of both, there are solutions such as rose gold, which can be worn with either. Some engagement ring settings come with both white gold and yellow gold, which allows the ring to match no matter what other jewelry, she wears. When looking at engagement rings it is easy to get caught up on sets. These often require being sottered together after the wedding so the band and the ring are always together. This is a nice look, but sometimes it is not practical for work purposes or if you are planning on having children. There are times being able to just wear the wedding band is preferable. If your future wife tends to use her hands a lot, it might be nice to have the option. Engagement rings are not very easy when you have a baby. Many new mothers stop wearing their ring because the protruding diamond gets caught on things or can turn on her finger and scratch the baby. A nice, smooth wedding band to wear solves the problem. 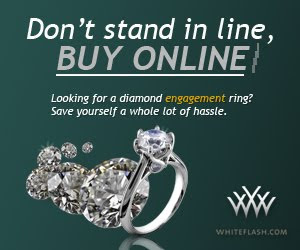 Insurance and lifetime warranties are key when shopping for engagement rings. Looking into shops that can fix the ring or repair the ring for the long term tend to give you peace of mind. That does not mean smaller shops should be ruled out. You can always look into insurance policies. Engagement rings are very expensive and easy to lose. While the ring is unlikely to leave her finger for the first few years, as life goes on, it might get left at a hotel or on a sink somewhere. By getting an engagement ring policy, you protect your investment. Many policies are inexpensive and offer you the peace of mind as you go through your life. No one wants to pay for an engagement ring twice. Many larger stores can offer discounts, but it also means the engagement rings are more standard. Other women might have the exact same ring as your wife. If your girl is a little more unique than that, looking at boutique jewelry stores or antique stores might be the way to go. You can find a perfectly beautiful engagement ring that is entirely unique for your wife. Classic rings with a history always make for a nice story, so finding one at an estate sale or a used store, might be just the classic look you are seeking. No matter how you go about the proposal, finding the engagement ring will likely take longer. The perfect ring for this once in a lifetime occasion is out there. Keep an open mind and just take your time. With a little patience, you will find the engagement ring you are looking for, the one that will make her say yes. Are you thinking about having a backyard wedding? If not, you should! They are so beautiful, intimate, and lets be honest – easier on the wallet. If you are going to have a backyard wedding make sure that your lawn is looking its best. To take the stress out of worrying about that from your big day, Mighty Green Lawn Care can take care of all of your lawn care birmingham al needs. Antique style engagement rings are rings that are more than fifty years old. The style of the ring depends on the time period in which it was created. The most popular antique style engagement rings are from the Art Deco period of the 1920s and 1930s. Other popular styles are Victorian, Edwardian, and Art Nouveau. An antique style engagement ring makes a unique statement. It can either be a true antique or a modern replica of old jewelry. If you love the look of vintage jewelry, but don’t care about the history, you may want a new ring that has been designed to look old. However, if you are a romantic who loves the idea of owning a ring that was worn in the past; you may want a genuine antique. Victorian jewelry is popular in antique wedding rings. Yellow or rose colored gold was most often used for the settings. Diamonds became very popular at this time with the discovery of the mines in South Africa. Diamonds began to be used as accents around the main diamond. In some cases, pearls were used to accent the diamond. Rings from this time period were created between 1835 and 1900. These rings generally have an elegant and intricate design. Antique platinum engagement rings were first seen in abundance during the Edwardian period from 1900 to 1920. Intricate detail was carved into the rings. The designs are delicate. Diamonds accented with sapphires or other colored stones became popular in this time period. Art deco rings are usually either platinum or white gold. The style is often geometric in shape. Diamonds in a platinum setting are the most expensive antiques from this period. Sometimes rubies, sapphires, and emeralds were used in place of diamonds in a white gold setting. Art Nouveau rings are from the time period of 1930 to 1949. Styles were often influenced by jewelry worn by movie stars. Rose gold was the most popular setting color in a variety of unique and intricate settings. Diamonds combined with rubies are often found in rings from this time. You can find antique jewelry in estate sales, pawn shops, and antique stores and on the internet. Some jewelers specialize in vintage jewelry and are knowledgeable in this area. Make sure to get the description, age, condition and diamond information in writing. Ask for a report from a certified appraiser. Always get your own independent appraisal of antique style engagement rings. Thanks to our sponsor Kamm Star Contractors, the finest company for air conditioning installation Brunswick Ohio. We appreciate everything you do for us! Whether you are buying an engagement ring to surprise the love of your life, or the two of you are shopping together, we’ll help you sort out all the confusing details you need to understand before you choose this most meaningful gift. Many guys like the idea of surprising their intended with a proposal and ring and many women think they like the idea of being surprised. But they probably like the IDEA of being surprised more than they like the actual surprise. The surprise proposal is a very romantic notion, one that has been fueled by countless movies and television shows over the years. The reality, however, is that a bride can expect to wear her engagement ring every day for the rest of her life. The engagement ring buying guide can help you choose the right ring for your surprise proposal. Unless you know each other extremely well, and you know her tastes in jewelry, it really does make more sense, from a practical standpoint, for her to help select her own engagement and wedding rings. So this engagement ring buying guide is written for both of you. Hopefully, it’s something you will share and talk about. It’s important for both of you to be happy about the engagement ring you choose. This will be just the first of many important decisions you make together. This is a time in your lives that you will cherish and enjoy remembering over the years. My husband and I still enjoy remembering our shopping trip to choose my engagement ring. It was a fun and exciting time. Because we were prepared and started with an idea of what we wanted, we were able to find a ring that met our quality criteria and was within our budget, in one shopping trip. And because we knew where to shop for the best price, we didn’t have to spend the time to comparison shop. That’s a win-win-win! He says he knew this was the diamond to buy because my whole face lit up when I saw it. And I love the ring today just as much as I did the day we bought it. Give some serious thought to creating these memories. They will last a lifetime. So you’ll want them to be happy ones, or at least memories you can laugh about, not memories that make you wince whenever they’re recalled. You want her to be in love with the ring almost as much as she is with you. You really don’t want her to return it and exchange it for something else, as one celebrity bride-to-be did recently. That would mar your memories of your engagement. And you’ll have to listen to her tell that story to her friends for years! You also don’t want her to look at it wistfully over the years, silently wishing it were something else. It’s best to make sure she’s happy with it before you spend thousands, or even hundreds, of dollars. If you just HAVE to surprise her with it, let the timing be the surprise, not the ring itself. Thanks NW Window Tinting for sponsoring us today! Did you know that engagement ring history begins before the time of Christ? Centuries of tradition surround this popular outward symbol of love and commitment. The ring as a symbol of marriage can be traced as far back as Ancient Egypt. The endless loop symbolizes eternity, and the open center represents the gateway to a new partnership. The earliest known betrothal rings, signifying a promise to marry, were made from hemp, rushes, leather, bone or ivory. Egyptian images from 5,000 years ago depict rings made of rush and grass, which were surprisingly practical, lasting about as long as the short engagement. The history of the engagement ring took an important step forward when Ancient Romans introduced rings made of metal and gradually began to use a plain iron band as a betrothal ring. Wealthier Romans wore the iron band indoors and exchanged it for a gold band outdoors (iron does rust, after all). Simple inscriptions inside the band appeared as early as the 4th century A.D. Wealthy Romans occasionally fashioned betrothal rings from silver or gold, to signify that the man trusted his wife with his valuable possessions. In the Middle Ages, precious gemstone engagement rings became popular, with the addition of colored stones such as sapphires and rubies. Engagement ring styles have continued to evolve throughout engagement ring history. We’ve already discussed plain bands made of various materials, ranging from reeds and rushes to leather and other materials, and then metal, beginning with iron and gradually moving to gold and silver. The “fede” ring (Italian for “faith”) had a central image of two clasped hands. A similar design, known as the “gimmel” ring (Gaelic for “bond” or “tie”), is actually three separate bands which join at the base to become one. The outer bands each have an outstretched hand, and the center band contains a heart. When a couple was betrothed (a much more formal, legally binding agreement than today’s engagements), the bride- and groom-to-be each kept one of the outside bands, and a witness to the betrothal retained the center ring with the heart. Gimmel rings were popular in engagement ring history. At the wedding ceremony, the three parts were re-joined to become the wedding band for the bride. When the three pieces are put together, the two hands clasp each other, and when rolled open reveal the hidden and protected heart. The gimmel ring is believed to have been the inspiration for the still-popular Irish Claddagh ring, a design often used for friendship and wedding rings that has two hands holding a heart topped with a crown. Thanks to the best of memphis roofing companies for sponsoring our post today!